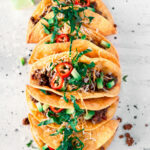 Super simple crispy beef tacos with homemade shells, topped with the best Tex-Mex fixings! From Minneapolis Food Blogger A Simple Pantry, get ready for a flavorful 30-minute meal perfect for any weeknight dinner adventure! In a small frying pan, add canola oil to a depth of 1 inch. Heat to medium, then add one tortilla and fry into a shell-shape, using tongs to pull one end from the oil, turning the shell occasionally to fry evenly, around 1 minute per shell. Place on a paper towel-lined plate to drain of excess oil. In a large skillet over medium-high heat, add the ground beef, 1 cup of salsa, and a sprinkle of salt and pepper. Cook, breaking up the meat as it cooks, until no longer pink, around 5 minutes. Drain excess fat if desired. Add the garlic and seasoning and stir until fragrant, about 1 minute. Add remaining salsa and simmer for 5-10 minutes. Remove from heat. Spoon meat into taco shells, then top with cheese, lettuce, avocado and cilantro, or any other preferred toppings. Enjoy immediately. *nutrition info includes up to 1/4 cup of absorbed canola oil for 12 fried shells. actual rates may vary.